I’m a bit nervous to mention this but I’m in a 20 minute documentary on the power of craft *gulp*. The filmmaker Rachel Tavenor asked me about a year ago now to be in her short film for her Masters Degree final project. It’s a documentary of my story of getting in to craftivism and the story of Neil an ex-prisoner who got into craft through working with Fine Cell Work while in prison. Again, it sounded like a great way to spare the power of craftivism with a wider audience, although I squirmed a bit thinking about a film camera in my face but then said “sure”. I’ve seen the final edit and Neil’s story is so powerful it’s really worth watching. I hope I come across OK :s As you know, I’m not very photogenic and get nervous around cameras plus I was very honest with Rachel during the filming process which now makes me embarrassed but hopefully it will encourage people to pick up craftivism and see that generic rx online pharmacy anyone can do it! Stitched Stories weaves the interlocking narratives of the Craftivist Collective founder, Sarah Corbett and ex-prisoner Neil who continues to sew for Fine Cell Work. 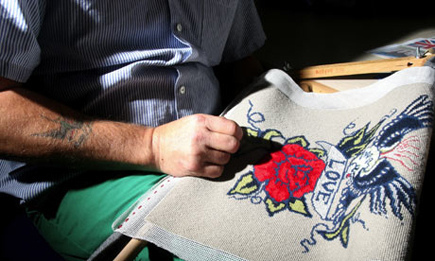 The documentary reveals the power and potential of needlecraft on their lives. The film will be followed by a panel discussion between the director Rachel Tavernor, Neil & I on the power of needlecraft. Spaces will be limited and on a first come first served basis. To book your place please email popup@finecellwork.co.uk or call the shop on 07553 465715. More info here. This is a free event, part of FCW’s London Design Festival week. Drinks and nibbles will be available and donations are always gratefully received. If you can’t make the preview the film will be available online and on DVD from the film maker in the near future.